Nuclear power, biofuels, clean coal: These are the Obama administration’s answers to climate change. The 2011 budget, released this week, promised new loans for the construction of nuclear power plants, and on Wednesday the Environmental Protection Agency (EPA), White House, and other departments detailed steps to encourage ethanol and clean coal production. These initiatives may garner support from conservatives, but their ascendancy comes at a price. Support for renewable fuel sources, like wind and solar, has dwindled. President Barack Obama did encourage Senate Democrats to pass a climate change bill, but some moderates are bucking the cap-and-trade provisions that could tamp down carbon emissions. Those moderates are pushing for legislation that leaves carbon caps out entirely. Given this country’s weak efforts to tamp down carbon emissions, though, perhaps the IPCC’s prediction that those glaciers likely will disappeared by 2035 will turn out to be accurate. New nuclear plants—but at what cost? Obama’s budget, as Sheppard reports at Mother Jones, is upping funding for nuclear plant development, even though previous nuclear projects have run wildly over budget. The president has always supported increased nuclear production. As an Illinois Senator, Obama had Exelon Corporation, the country’s largest nuclear operator, in his constituency. The company continued to support him as a presidential candidate. The proposed funding runs in the neighborhood of $54.5 billion in loan guarantees for nuclear projects. That’s good news for an industry that’s in need of cash. As Sheppard explains, without governmental backing, these plants would have little chance of being built. The Obama administration is also backing research into nuclear waste disposal, a prerequisite for nuclear expansion. No matter how “green” nuclear energy production might be, so far there’s no safe, sustainable way to deal with its by-products. Finding a long-term solution for nuclear waste disposal will not come cheaply. The administration’s support for biofuels was bigger slap in the face to environmentalists, though. Just a few years ago, ethanol made from corn or switchgrass ranked high on the list of renewable fuels that could spring America from its Middle East oil addiction. In practice, however, biofuels have proven more environmentally destructive and less efficient than advocates had hoped. With farmers in the Midwest knee-deep in corn marked for ethanol production, though, backing away from biofuels is politically dicey. The consequences are more than political, however. At Grist, Tom Philpott argues that support for biofuels will ultimately drive global carbon emission up, rather than down. It’s not just corn and switchgrass that pose a problem, either. As Gina Marie Cheeseman reports at Care2, algae farms, another potential source of biofuel, face their own challenges. Algae demands high energy input and could release more carbon dioxide emissions that it would save, according to a new report from the University of Virginia. There’s more research to be done before writing algae energy production off, however. In January, the Department of Energy said it would sink $44 million into work on algae pools. Industry players like ExxonMobile are also underwriting research on the subject, Cheeseman writes. Moving towards energy sources like nuclear power and ethanol does take the country a step closer to responsible energy production. But right now, the Obama administration is not leaving room for new or ambitious ideas that could do more. 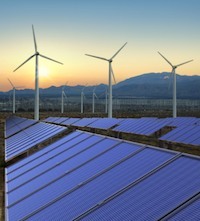 Wind and solar, which would form the best foundation for a sustainable energy future, have few advocates in Congress. They also seem to have no role in the near-term energy plan. Ethanol was the Midwest’s first green industry, for instance, but there are other possibilities for juicing up the region’s clean energy production. In The Nation, Lisa Margonelli lays out the case for “gray power,” which is recycled energy produced by the old, dirty smokestacks that ring cities like Cleveland. A project like Margonelli imagines, however, would require significant commitment and vision from the federal government, both of which are lacking right now.